A diamond moment! Forever in love. If we turn back the clocks to when the cave men existed, the ring which was normally made from garlands and flowers, were given to a woman as a symbol of ownership by the male. This symbolism of ring giving still exists but has since become a joint decision between the man and the woman. Engagement rings have been used for centuries but the use of diamonds was relatively recent. The main reason for this was because diamonds were not available on the world market. It was only in the 1870’s when miners began to find diamonds that we began to see more and more diamonds being used so prolifically. However, a rare occurrence took place in 1477 when Archduke Maximilian of Austria gave a diamond ring to Mary of Burgundy. Most of us will always associate an engagement with the giving of a diamond ring but the tradition was owing to a marketing campaign started by De Beers back in the late 1930s. Frances Gerety wrote the slogan ‘A Diamond Is Forever‘ and it has appeared in every De Beers engagement advertisement since 1948. Thousands of years ago the Greeks and Romans believed that a vein from the fourth finger in the left hand ran directly to the heart. By placing a ring on this finger was a way to be in direct contact with the vena amoris… the ‘vein of love’. Although this has been proved to be untrue, the tradition has continued right through to today. The name ‘diamond‘ comes from the Greek word ‘Adamao‘ which means unconquerable – suggesting the eternity of love. Since ancient Greece, diamonds and diamond jewellery have been the traditional symbol of love, and the ancients believed they were hardened dew drops, splinters from the stars or crystallized lightning. The Private Diamond Club are proud of the wonderful collection of diamond engagement and wedding rings and share the sentiment that diamonds are a true symbol of love! The ruby which is the birthstone of July, is also a symbol of romance and devotion making it an excellent choice when deciding which stone to have for an engagement ring. The ruby is also the traditional wedding gift for couples celebrating their 15th and 40th anniversary. In England, the ruby was used for coronation rings and to this day enjoys popularity among royalty. In 1986 Fergie, Sarah Ferguson who became the Duchess of York received a ruby engagement ring from Prince Andrew. In the ancient language of Sanskrit, ruby is called ratnaraj, or ‘king of precious stones‘ and in the first century AD, it was the Roman scholar Pliny who included rubies in his Natural History describing the stones as being a very hard and dense stone. The origins of the name ruby comes from the Latin word ruber, meaning ‘red’. In the early days the ruby was also a representation of the sun, giving the ruby a more profound significance with integrity, devotion, happiness, healing, courage, romance, generosity, inspiration, and prosperity. Since the ruby has been used as a gemstone for centuries, it can be seen in a variety of styles, from Indian jewellery to Art Deco and contemporary fine jewelelry. Being a durable material, the ruby that can be worn daily as rings, earrings or necklaces. In Indian style jewellery, rubies are often mixed with emeralds and diamonds using gold settings to provide a striking contrast to the red of ruby. More modern jewellery settings for ruby include white gold and platinum, whereas traditional settings tend to be gold. Where rubies are found in the world? Rubies have historically been mined in Thailand, the Pailin and Samlout District of Cambodia, Burma, India, Afghanistan, Australia, Namibia, Colombia, Japan, Scotland, Brazil and in Pakistan. In Sri Lanka, lighter shades of rubies (often “pink sapphires”) are more commonly found. It is the colour of the ruby that is its most important quality factor. The most sought after colour is a strong pure red to red with a hint of blue. The ruby is often mixed-cut, with brilliant-cut crowns and step-cut pavilions. The most common shapes you will see are ovals and cushions but rubies of over one carat are very rare, so the price increases greatly with size. The Four C’s of selecting the perfect diamond – colour, clarity, cut, and carat – also apply to rubies. Alan Caplan’s Ruby or the Mogok Ruby: It is really impossible to find out about the finest ruby ever present. However this stone holds the distinction of being finest with a highest per carat price. It is 15.97ct untreated Burma beauty auctioned by Sotheby in 1986. It was reportedly purchased by Graff and later sold for a huge sum to Sultan of Brunei. The Private Diamond Club have now introduced rubies to their collection of precious coloured stones jewellery, along with emeralds and sapphires. The Roxana is an exquisite diamond and ruby ring set in 18K gold. The siam ruby is 4.98ct is set in a twist design with 468 diamonds totaling 2.37cts. the Sapphire as your birthstone. Sapphires have been treasured for thousands of years and it was the ancient Romans who polished them so they can be worn as jewellery. The most valuable colour of Sapphire is a cornflower blue colour, known as Kashmir Sapphire or Cornflower Blue Sapphire. The Kashmir region of India/Pakistan was famous for its Kashmir-blue Sapphire, but little comes from the region now. Sapphires are however found in many places around the world, including Australia, Madagascar, Malawi, Sri Lanka, and the United States. Sapphires are one of the most durable natural elements in the world. Gemstones are rated on their ability to withstand scratching based on a system called the Mohs Scale of Hardness, and Sapphires score a high 9 out of 10 and with only the diamond that can scratch a sapphire. The durability of Sapphires makes them an excellent choice for engagement rings and other pieces of jewellery that you plan to wear every day. Deep blue sapphires have long been associated with royalty and it is quite possible that this association may have contributed to the naming of the colour ‘royal blue‘. Medieval kings often wore Sapphires believing the gemstones would protect them from their enemies. The sapphire was said to represent the purity of the soul and priests before and during the Middle Ages would wear sapphires as protection from impure thoughts and temptations of the flesh. Sapphires are used both as centrepiece gemstone in pendants and rings, as well as a secondary stone to complement other gemstones such as Diamonds. French Emperor Napoleon Bonaparte gave to his beloved Josephine a sapphire engagement ring in 1796. It features a pear-shaped Sapphire next to a pear-shaped Diamond, on a simple gold band. In 2013 the ring sold at auction for $1.17 million to an anonymous buyer. 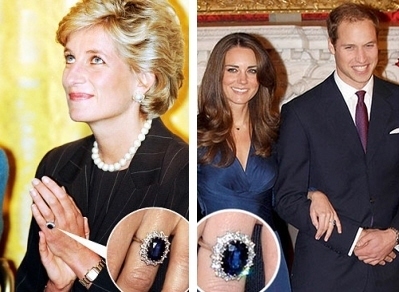 The most famous royal Sapphire today is the engagement ring featuring an 18-carat oval blue Sapphire surrounded by Diamonds, given to Lady Diana Spencer in 1981 by Prince Charles. It has seen been given to the now Duchess of Cambridge, Kate Middleton to celebrate her engagement to Prince William. The Private Diamond Club have now introduced three beautiful sapphire pieces ‘Sabrina‘, ‘Stella‘ and Sophia. These rings are created using quality stones and 18 carat yellow, white or pink gold. A piece of jewellery to truly love and treasure forever. Emerald mines can be traced back to 3500 BC in Egypt, owned by Cleopatra, who was known to have a deep passion for these gems. Incredibly the oldest emerald on record is 2.97 billion years. It is not surprising then that emeralds are associated with royalty and romance and so much intrigue. Today, the top three locations in the world for emeralds are Zambia, Colombia and Brazil. Each location produces emeralds of a slightly different shade, from the warm and intense green colour of Colombian emeralds to the cooler, bluish green gems of Zambia. Emerald has many special qualities, but coloured stone professionals generally agree that emeralds are, most of all, about colour. Emerald has been the standard for green among coloured stones for thousands of years. The most desirable emerald colours are bluish green to pure green, with vivid colour saturation and tone that is not too dark. The most-prized emeralds are highly transparent. Emerald inclusions are often described as looking mossy or garden-like. They’re sometimes called “jardin” which is French for garden. The rich green colour of emeralds is the colour of spring. The Private Diamond Club have now introduced a few beautiful emerald pieces ‘Elizabeth‘ and ‘Estella‘. These rings are created using quality stones and 18 carat white gold. A piece of jewellery to truly love and treasure forever. Yvan Delcourt, investment diamond expert and founder of the Private Diamond Club tells us that the most common shape of diamond is the round one or “brilliant cut”. With 57 facets it is the form that returns the most light and is the best selling and most expensive. There are other shapes, known as “fantasy” that are used in jewellery. 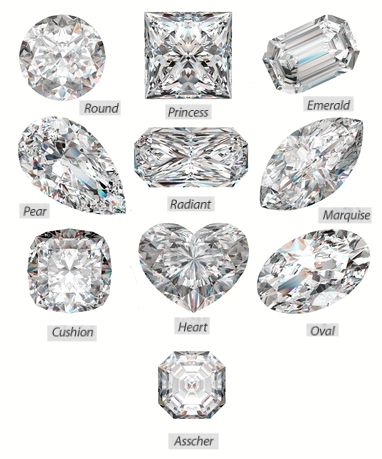 We feature 10 shapes, the princess cut, emerald, pear, radiant, marquise, cushion, heart, oval and asscher. Round Brilliant: Developed around 1900, the round diamond is the most popular cut given to diamond. It is usually the best choice in terms of saleability, insurability (due to its relatively “safe” shape), and desired optics. Princess Cut: The princess cut is the second most popular cut shape for diamonds, next to a round brilliant. The face-up shape of the princess cut is square or rectangular and the profile or side-on shape is similar to that of an inverted pyramid with four beveled sides. The princess cut is a relatively new diamond cut, having been created in the 1960s. Emerald: Stones whose outlines are either square or rectangular and whose facets are rectilinear and arranged parallel to the girdle are known as step- or trap-cut stones. These stones often have their corners truncated, creating an emerald cut with an octagonal outline. This is done because sharp corners are points of weakness where a diamond may cleave or fracture. Instead of a culet, step-cut stones have a keel running the length of the pavilion terminus. Like other fancy shaped diamonds, emerald cut diamonds can come in a variety of length to width ratios. The most popular and classic outline of emerald cut diamonds are close a value of 1.5. Pear (or teardrop cut): The first pear-shaped diamond was created in the 1400s by Flemish cutter Lodewyk van Berquem of Bruges, inventor of the diamond-polishing wheel, or scaif. This invention enabled him to polish all the facets of the diamond to optimize light reflection within it. It was from this watershed moment onwards that diamonds began to be used in jewellery. Radiant: This very special cut is the result of one man’s dream to combine the elegance of an Emerald Cut with the unparalleled brilliance of a Round Brilliant Cut. The Radiant Cut diamond allows people to choose a square or rectangular cut without compromising on brilliance. Recently, the shape has also gained popularity as a preferred choice for engagement rings. Usually these diamonds are set as a solitaire, but they also look amazing when set with either baguette or round shoulder stones. Marquise: The name is derived from the Marquise of Pompadour, for whom King Louis XIV of France allegedly had a stone fashioned to resemble what he considered her perfectly shaped mouth. Because marquise diamonds are long and narrow, they can also create the illusion of greater size. Owing to the shape this cut is sometimes known as a “Navette” (little boat). Cushion: The cushion cut diamond once referred to as old mine cut) combines a square cut with rounded corners, much like a pillow (hence the name). … While generally less brilliant than round brilliant diamonds, cushion cut diamonds often have better fire, which is part of their appeal. This classic cut has been in existence for almost 200 years, and for the first century it was the most popular diamond shape, similar to round cut today. Heart Brilliant: Heart shaped diamonds are very popular in solitaire pendants as well as rings and are of course, the unique and unmistakable symbol of love. When choosing a heart, symmetry is a very important characteristic, since it is critical that the two halves of the heart are identical. The first recorded heart shape diamond appears in a portrait entitled “The Gonzaga Princess,” painted around 1605 by Frans Pourbus the younger. Oval: The diamond oval cut is a newer type of cut created in the 1960s by the popular diamond company Lazare Kaplan International. The cut is a modified brilliant cut which preserves many of the supreme qualities of the original – and exceptionally flashy – round brilliant cut. Most oval cuts contain 56 facets, but some may have a few more facets depending on how the underside of the stone (known as the pavilion) is cut. Asscher: In 1902 Joseph Asscher designed the original Asscher cut. This emblematic cut was the first signature cut to be patented. The Asscher Diamond Company held its exclusive patent until the Second World War and saw strong sales internationally. This cut’s popularity peaked in the late 1920s but remained a somewhat rare commodity for the remainder of the century, available only in antique shops and specialised Art Deco jewellers. At the onset of the new millennium, following considerable research and development, the Asscher cut was redesigned with new specifications and additional facets for a more brilliant shine, and has since regained its popularity. Whatever your preference for the style of diamond is, you can always speak with the Private Diamond Club who will be happy to help and advice. The Private Diamond Club always issue a certificate with every purchase which is the best way to guarantee the authenticity and quality of the diamond. you could save up to save 50%. As you prepare to spring clean your wardrobe to reflect the change of seasons, why not brighten up your jewellery box with one of our stylish diamond rings? Next Tuesday sees the start of the 69th edition of the Cannes Film Festival. Along with being the world’s most famous celebration of cinema, the event, which runs from the 11th – 26th of May on the French Riviera, offers ample opportunity to star gaze as Hollywood’s A list arrive at both screenings and parties showcasing high fashion and stunning jewellery. Private Diamond Club presents an amazing collection of diamond rings. Discover some new models of diamond rings that will, for sure, attract one’s attention. All diamonds offered on Private Diamond Club are sent to the clients with special certification given by independent laboratories: The Hoge Raad Voor Diamant (HRD), The Gemological Institute of America (GIA), The International Gemological Institute (IGI). All orders will be delivered within 8 days, without any additional costs. Like diamonds, coloured precious stones are cut to reflect the maximum amount of light that is cought by the stones. The length of the path on which the light is reflected inside the stone, influences the absoption of light, and therefore the stone’s colour. This means a clear coloured precious stone can have a certain height and a cut in the appropiate shape that elongates the path the light follows inside the stone, which results in a more intense colour. The opposite is true for a darker coloured gemstone, this must have a more flat shape. In coloured precious stones, the size is mostly responsible for it’s beauty ; it enhances the colour and personality of the stone. Coloured gemstones have the ablility to reflect the light in different colours, depending on the angle in which the stone is being held. This phenomena is called « pleochronism ». This effect can be weak, medium or strong. 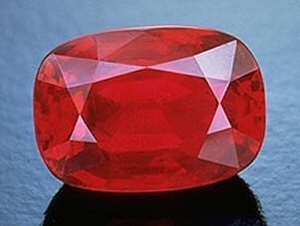 This is why the ruby, which has a very strong variation in colour ranging from orange red to deep carmine red, when the stone is observed in different angles. Inclusions that influence the purity of the diamond and therefore it’s value, don’t have as much of an effect in coloured gemstones. They often even contribute to the visible qualities of a certain stone. Coloured gemstones are transparent objects, like diamonds. They also absorb, let pass through and reflect the light like diamonds, but in a more modest way. If a precious stone doesn’t contain any metal, as is the case with pure diamonds, all light passes through. Each metal that is included in the composition of the gemstone (chrome, iron, cobalt, copper, manganese, nickel, vanadium) absorbs a specific wave length in the light directed at the stone. If the stone, like ruby, contains chrome, blue and green in the light are absorbed and the stone appears red. The same phenomenon, but with different chemicals in the composition, appears in sapphires and emeralds. The extreme variety of metals and amounts of these metals captured in the composition of the stone, is responsible for an infinite choice in colour and hue. Because of that you can truly say that every gemstone, even more than for a diamond, is unique. In contradiction to diamonds, coloured gemstones are not evaluated with help of international criteria. Therefore the stones must always be certified by the international laboratories HRD, GIA or IGI after being purchased. The criteria that are most important for this evaluation besides the physical description of the stone (its size and weight) are : origin of the stone, tone, uniformity and vivaciousnes of the colour, purity and size (proportions and symmetry). Purchasing a coloured gemstone, if the origin of the stone is guaranteed, will always be a very personal and therefore subjective process.